Sometimes people get bored of their wall because they look too plain, so I’ve talked about a few ways they can make them look more attractive. You don’t have to look at your boring walls every time you walk into your home. There are plenty of cool things you can do to make them stand out. And we’re going to go over some of those ideas today. You might not want to use them in certain areas of your home. But I’m sure you’ll find a way to accommodate one or two of them somewhere if you’re looking for something a bit different. If you pulled out a pen and started drawing all over your wall people would think you had gone a little crazy. But you can get around it by using chalkboard paint. Once you apply chalkboard paint to your walls, you’ll be able to draw on them whenever you like. And you can wipe it clean when you get bored of your current design. This is a cool idea for anyone with a home office. Because it’s a lot more exciting than hanging a huge whiteboard on your wall. If you’re a fan of comic books you might have a stack of them piled up somewhere. But how often do you actually read them? How often do you get to admire the beautiful front covers when they’re stuck underneath a huge pile of comics? I wouldn’t suggest doing this with limited edition comic books you might be able to sell further down the line. But you could carefully cut the front covers off some of your more attractive comics and use wallpaper paste to stick them to your wall. You’ve probably seen this done many times before. But I bet it was inside a child’s bedroom. Their parent would buy some lovely stencils and use them to paint the walls. So they ended up with a beautiful design once they were finished. This isn’t just a tactic you can use when you have small children because there are thousands of attractive designs you could showcase on your wall if you bought the right stencils. So have a look around and see if there are any you like the look of. Lots of people are into collecting things as a hobby and they’ll acquire different parts of their collection from all around the world. The example I’m going to talk about today requires you to collect different bottle caps from beer bottles. But if you use your imagination I’m sure you could come up with plenty of other ideas. Whenever you find a new beer you’ve never tried before you should stick the cap to a certain wall inside your home. And you can go out of your way to taste new beers so you can add to your collection. Once you’ve studied art you’ll learn it’s completely subjective and everyone will have different tastes. You might get your hands on a Picasso masterpiece and some people wouldn’t get excited by it if you didn’t tell them who the artist was. But those same people might get excited if you decided to stick a bunch of old license plates to your wall. If you look online you’ll be able to find them for sale. And because of their shape you can position them so they actually look like one piece of art work hanging from the wall. Who said home improvement needs be to complicated? 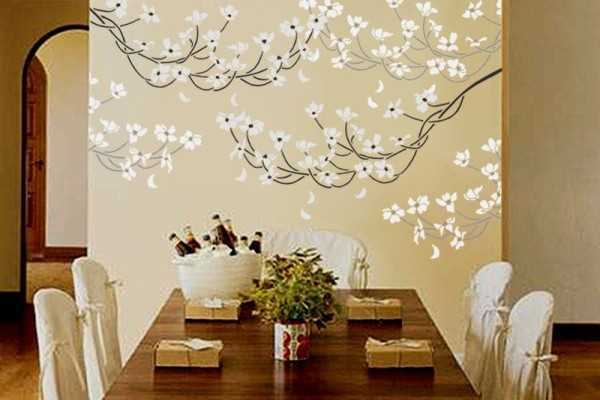 As you can see there are plenty of creative ways to make your walls more attractive. And we’ve only scratched the surface. If you like the sound of anything we’ve spoken about today you should test it out even if you only start small. Today’s guest author, Karen Fernandes, is a freelance blogger, who enjoys writing on home improvement and decoration online. Her hobbies include gardening and pottery. How about a gallery wall? Filled with favorite photos and art prints that will make you smile every day. If you use EasyGallery® frames, it’ll only take a few minutes to set it up. Best part – it’s totally changeable. So, you can switch things up for a fresh look any time – in seconds. And, you can store the prints in back for the next time you want a change! Great idea. Thanks for sharing. Making photo and art hanging so much easier.